Having completed their fifth day at sea Sarah Sarah’s crew is undoubtedly celebrating having half of the 2275 nautical miles to the Straights of Juan de Fuca behind them (actual distance with weather jogs is likely to be closer to 2400 miles). According to Rick Shema (see below) they have one more frontal passage, perhaps gale force, and then the long range forecast is quite good considering the time of year and location. Your position report was received through YOTREPS. 1. 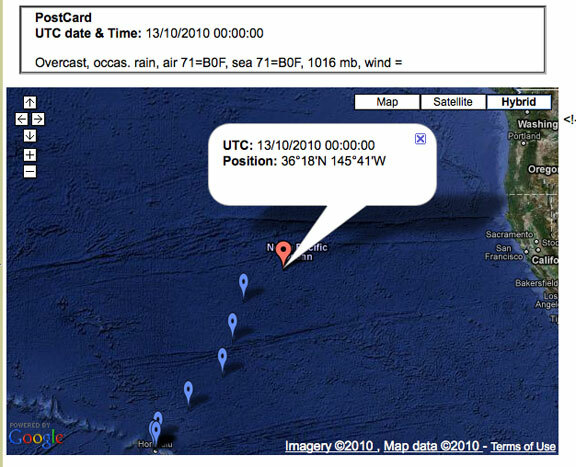 Weather Summary as of 12 October 2010 0200HST. 2.5m before front and 3.5m after front. Mixed swell NW and NE 1.0 to 1.5m. Higher conditions in localized squalls and instability. The ability to average 9.5 to 10 knots which allows them to take advantage of good weather and avoid unpleasant. A skipper’s mindset that is determined not to waste weather opportunities. Coordination with a weather router who understands both the weather, capabilities of boat and crew, and how to meld these ingredients for the best possible outcome. A knot less average boat speed, an extra day or two sampling Hawaii’s pleasures, and this could have easily been a fight with a succession of strong gales (or worse). However, before we get too far along with kudos, keep in mind the time of year and proximity to the Gulf of Alaska. Although the prognosis is looking good, nobody is going to relax until Sara Sarah is safely moored at the end of her passage. This entry was posted on Wednesday, October 13th, 2010 at 6:38 am and is filed under FPB 64 Updates. Both comments and pings are currently closed.